Monsters and camp stories just seem to go together. but this recounting of a young teens experience in 1961, strikes me as much more than a mere campfire tale. He tells it so well that I’m going to just put it in his own words, leaving out names since I don’t have permission to give them. I think it’s a fascinating look at Bigfoot behavior in many ways, particularly in regard to interest in humans and human activities. Coincidentally, the report came in while I was at Creature Weekend 2012 in Cambridge, Ohio. (The photo above was taken in their resort lobby) Enjoy! Listening to Coast to Coast, I was shocked to hear about bigfoot in southeastern Wisconsin. Let me tell you about my experience. Keep in mind that I am a college graduate and a recently retired high school teacher. I do not belong to any strange sects; in fact, I’m rather nerdish. Truly, I’m quite believable. In 1961 I was a 15 –yr old summer school student at St. John’s Military School in Delafield, Wisconsin. I lived in one of about 20 cabins that were organized in a semi-circle in a forested area. In the 20 cabins lived other boys who were my age. At the center of the semi-circle, there was a night lamp on a high pole; vision was excellent. Under the light pole was a water fountain. The pole and fountain area is where group meetings took place. One night (I don’t remember the time – perhaps 1, 2 or 3 AM), I awoke to see a very large ape-looking creature who was drinking out of the fountain. The creature had to bend awkwardly to reach the fountain because it was at his knee level. By observing the awkward bend, I was able to ascertain that his/her height must have been enormous. Instead of drinking , the creature would spray the water out of his/her mouth and into the air. Then he/she would return for another gulp – and spray again! Due to the light, I had a very clear view. I was amazed but not yet frightened. After leaving the fountain, the creature took long strides and entered the first cabin. He/she stayed inside for less than one second. It seemed that as soon as the cabin door shut behind him/her, it instantly opened and he/she left the cabin. I noted that the creature had to “duck” in order to enter the cabin. Vision was not that great at the first cabin. The doors were rudimentary cabin doors with a spring and no latch. After leaving the first cabin, the creature continued to the 2nd, 3rd, 4th, ect. cabins, spending 1 second inside each. I began to think that this behavior was consistent with a counselor doing a “bed check” – but I was really curious about the huge size and hairiness. My cabin was about the 12th cabin. As the creature went cabin-to-cabin, my vision was getting better and better – and I slowly began to feel frightened. Keep in mind that vision was excellent at the fountain, but when the creature entered the first cabin, I could not see very clearly. By the time the creature was preparing to enter the cabin next to mine, the student inside the cabin let out a huge shout. “Help!” Truthfully, I was getting ready to scream also. Upon hearing the scream, the creature immediately sprinted with long strides to the rear of the cabins and disappeared into the forest. The creature ran through bramble and briar that would be difficult for a human to negotiate. As the creature approached the cabin next to mine, I did get a very good look. BIGFOOT! The boy who screamed was traumatized. A couple days after the incident, his father came to Delafield to take him home. Curiously, St. John’s summer camp lore had a legend about the creature. There were many stories about the creature. Needless to say, I plan to investigate this one further! Hello. Just wanted to say great article. And fantastic site!!!! Can’t wait to read more. Being a huge fan of Skookums,,I’m absolutely thrilled to learn of Canids!! And to Richard. Yes Sir. Great site. Amazing database and serious info. So very much goes unreported/unrecorded–permanently. The Bigfoot Research Organization is an excellent place to permanently park that report. One of its investigators may wish to interview him. i`ve read indian lore that BF has a language,but does very well with mental telepathy.i think it`s very interesting,that BF doesn`t fool with you when carrying a gun,bow or a machetti,otherwise they seem to love teasing,calling your name,bleating[like a deer]when you`re not.i`ve also read reports of some curios things they do with small trees 4-6 inches diameter,they break the tree about 20″ above ground half way thru,and twist the remaining trunk and lay the rest of the tree down at an odd angle,evidentally pointing in the direction that may mean something to other BF`s passing. [my theory only]when camping we stay close to the fire as is safe and stopped useing the deer commode at night,and bought a portable camp potty. Great story. 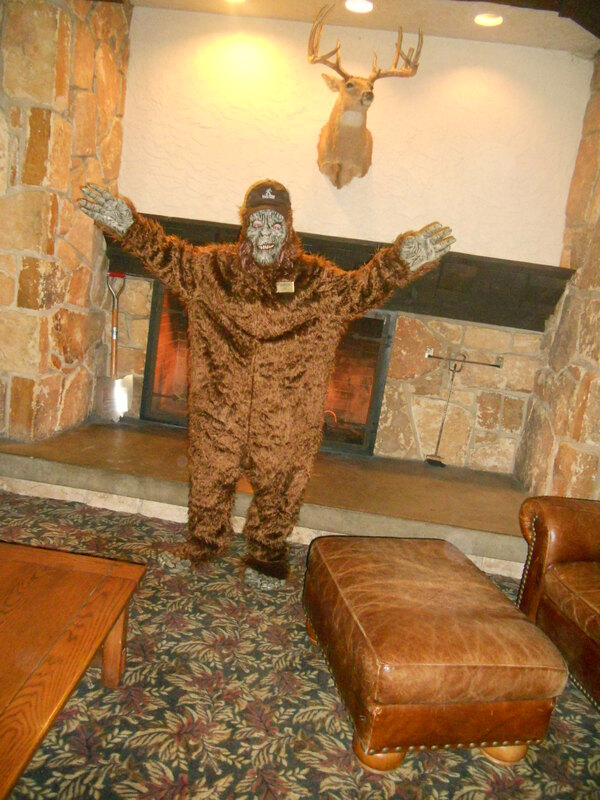 Strange bigfoot behavior, I haven’t heard anything like it! Keep us updated on your investigation!